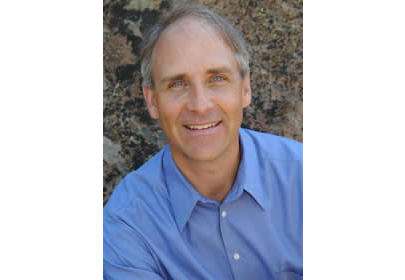 Robert Martin with Mountain Real Estate Group has one primary goal—to succeed in delivering premier customer service to clients buying and selling real estate in Conifer and Evergreen, Colorado. He strongly believes that this level of customer satisfaction is achieved through consistent, timely and accurate communication during and even after your real estate transaction. This philosophy is evidenced by the fact that in more than 23 years serving real estate clients, over 75% of his business is generated from past clients—clients who have been pleased with their experience working with him and have chosen to work with him again or have referred him to friends or family. Robert of RE/MAX Alliance provides you One PLACE to access all local listings from all brokerages on the market. This Online Database of homes for sale in Conifer, Evergreen, Pine, Bailey, Morrison, Genesee and Indian Hills provides a valuable tool as you search for your next home. Let his experience guide you through this complex market as he is always happy to help you in finding the perfect community in the Denver Foothills and home to fit your lifestyle. Please contact Robert today at (720) 924-0895 so he can provide the service and guidance you deserve to make the best home purchase decision possible. "From initial visit and suggestions, Robert and his team were spot on with suggestions and advice to improve the appearance of my home. His honesty and integrity in all our negotiations with buyers helped me understand the process and I was happy with the outcome. I am a widow and this is my first home sale alone and Robert was the realtor I went with and would again." Click the link above to view our complete community video library! Take a tour of Conifer, Evergreen and more. 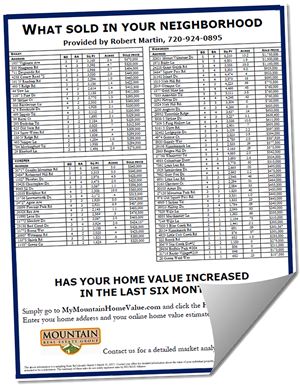 Curious about our local area house values? Click here for the latest report on What Sold In Your Neighborhood! Contact us if you would like a detailed market analysis of your home.